The true story of Beere, the Pilgrims, and Thanksgiving. That night we returned again a-shipboard, with resolution the next morning to settle on some of those places; so in the morning, after we had called on God for direction, we came to this resolution: to go presently ashore again, and to take a better view of two places, which we thought most fitting for us, for we could not now take time for further search or consideration, our victuals being much spent, especially our beere, and it being now the 19th of December . That debunks a late November landing, in time for what we know call 'Thanksgiving.' And, that part about the Pilgrims landing at Plymouth Rock because they had run out of beer? 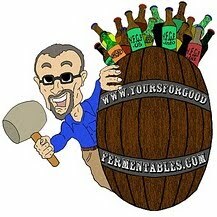 Not so fast, says beer historian Bob Skilnik. 1 That's not exactly what transpired. Land was sighted on November 9  but [the Pilgrims] didn't attempt to set out a landing party until days later, when they also realized they were no where near the Virginia Colony but instead were off Cape Cod. By December 4, they knew they had to quit being picky about where they were and settle down. Cold weather and disease were starting to take their toll. After an armed run in with some more Indians, the Mayflower headed south and another expedition found "running brooks," cornfields, and after sounding the depth of the harbor, realized this was about as good as it could get in the middle of December and the dead of winter. Despite what looked like prime territory, they took yet another look around, finally resolving that it was time to make a decision, pick a spot and start a settlement. That was some seriously unfortunate dithering by the Pilgrims. Despite this, the Pilgrims would survive. That they, passionate Christians, prized their supply of beer as an essential foodstuff stands in contrast to some less-tolerant latter-day religious views of alcohol. The ship's crew —hired hands— had, however, planned ahead. They stored a stash a beer, not for their landed passengers, but for themselves to consume on their own return trip to England after the winter storms had abated. Water was not always a healthy drink in the 17th century; sanitation was far from pristine. 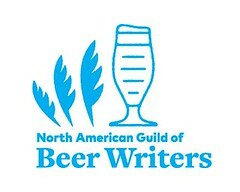 Beer could be a potable substitute. On shipboard, however, that beer was not low-alcohol or 'small' beer, as has often been reported. It was 'Ship's Beer', which, according to Skilnik, was "brewed to a high alcoholic content in order to keep it viable during a prolonged sea passage." It wouldn't be until two years later, in 1621, that the Pilgrims would first observe a Thanksgiving, if not calling it that, celebrating the colony's first successful harvest, with the Wampanoag, the local Native American tribe. In the ensuing decades, several local governments would proclaim days of thanksgiving, and, then, over a century later, President George Washington would declare a national day of Thanksgiving, in 1789. Several succeeding presidents would, as well. Be safe in your travels this Thanksgiving ... and, once you get there, stay put, give thanks, and enjoy your beer(e). 1 Bob Skilnik is the the author of a history of American beer and food (now unfortunately out-of-print: Beer & Food: An American History. The late William Brand of the Oakland Tribune wrote a good synopsis of Skilniks' research. Here, from 2007. 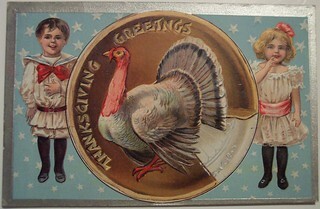 2 My references for the history of Thanksgiving is from Wikipedia. Not rigorous, I know, but sources are given for the data. 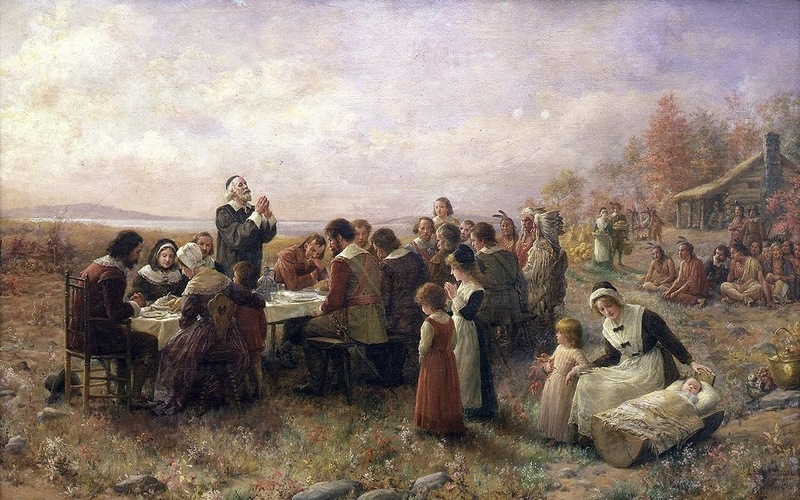 The painting at the top of the page, "The First Thanksgiving," is by Jennie Augusta Brownscombe (1850–1936), "an American painter, designer, etcher, commercial artist and illustrator. Brownscombe studied art for years in the United States and in Paris. She was a founding member, student and teacher at the Art Students League of New York. She made genre paintings, including revolutionary and colonial American history." Wikipedia (again!). "To give thanks is a matter of joy. Should that be confined by excessive sobriety?" How Michael Jackson, the British beer writer, saw American Thanksgiving: here.